Finally! A great Finder for OS X! The Finder has long been one of my least favorite aspects of OS X. Seems like the Finder has been an afterthought for Apple, and it has grown long in the tooth, missing handy features that have been standard on other OSes for a while. I’ve searched for Finder replacements and improvements many times, and tried a few. PathFinder and XFolders have lots of features, but didn’t seem to fit in. I finally found what I’ve been looking for. For some reason, google did not help me find it. I was tipped off to binaryage’s Visor by a developer friend, and stumbled upon TotalFinder while on their website. I couldn’t believe what I was seeing. First of all, TotalFinder is a Finder plugin, not a separate app, so it integrates perfectly with the rest of OS X. Then it adds tabs. And folders on top. And cut and paste to move or copy files! So nice. Cut & paste. No more drag & spring-load open folders & drop. Asepsis. What? They properly fixed the Finder’s .DS_Store litter bug? As an added bonus, I found out that TotalFinder is able to fix OS X Finder behavior that has bothered me for years, and I have never known how to fix. With the Asepsis option enabled, TotalFinder redirects all the .DS_Store information to a dedicated user folder, rather than dropping these invisible files in every folder you touch. Anyone who shares files cross-platform knows these files are annoying to see. The .DS_Store folder basically contains OS X specific viewing preferences, like window sort order, icon view, etc. TotalFinder does what the Finder should have done all along — store this data in a user directory. This way, users can have their own view preferences for each folder, and network drives, cross-platform drives, and zip files don’t get polluted. Read more details about this feature. 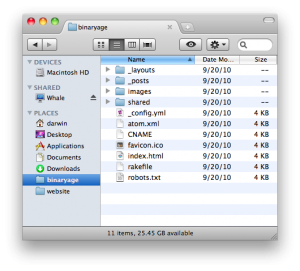 You have to check out this improved OS X Finder!